The purpose of cinema is often to entertain, but that is not always the case; sometimes, its purpose is to inform, to educate, or to enlighten. Such is the case with Steve McQueen’s 12 Years a Slave. Though it’s certainly not comfortable viewing, it is powerful, emotional, and heart-breaking film. Chiwetel Ejiofor plays Solomon Northup, a free black man living with his family in 1840s New York. A true story based on Northup’s memoir, 12 Years a Slave follows him as he is captured and sold into slavery, with him remaining in captivity as a slave in Louisiana for twelve years before being released. We are given a glimpse into the cruelty of the slave trade and the struggles that Northup faces during his time in captivity. In a film full of excellent performances – with “excellent” here meaning “painfully believable” – from the likes of Benedict Cumberbatch, Michael Fassbender, Paul Dano, and Brad Pitt, among others, it’s hard to imagine that one person would stand out – but stand out he does. Chiwetel Ejiofor delivers a performance that can be described with nothing less than the word “incredible;” the emotions he brings to the story, from joy to fear to anger to depression, are each powerful in their own way, and I found myself captivated every time he was onscreen. Another standout performance comes from Lupita Nyong’o as another slave named Patsey. She goes through quite a lot throughout the course of this film as well, from being the apple of the slaveowner’s eye to begging for death to being flogged for wanting to take a bath. Her performance is also an extremely emotional one – one that will likely bring you to tears more than once. Often in the film, we are treated to long, still camera shots that linger on Solomon’s face as he stares into the distance, contemplating his current situation. These shots are interesting in that they allow us to see the subtleties in Ejiofor’s acting skills; we can see his emotions develop in real time, like a glimpse into his soul, and it is an unusually compelling technique that works astonishingly well. During these scenes, and during other scenes in which the focus is mostly silence, we are also treated to Hans Zimmer’s minimal but profoundly touching musical score. He utilizes a single theme throughout the film, but each time we hear it, it seems to adapt a new meaning – hope, despair, hopelessness, joy, reunion, thankfulness, tension, and others are all heard in the repetition of this simple theme. Zimmer has been improving with each new score he releases, and it certainly shows here as he deviates from his typically exciting, driving scores to something much more intimate. This film is difficult to watch in many scenes as we are shown cruelties that no person should have to endure, but it is a sobering and important glimpse into our nation’s past. I mentioned earlier that the purpose of this film is not to entertain, a statement which may draw comparisons to my review of the 2012 Michael Haneke film Amour, which I only awarded 2.5 out of 5 stars because it was such an incredibly depressing film, no matter how artful or masterful it was in execution. Precedent might dictate that I rate this film similarly, but the fact here is that the two films are entirely different in nature. 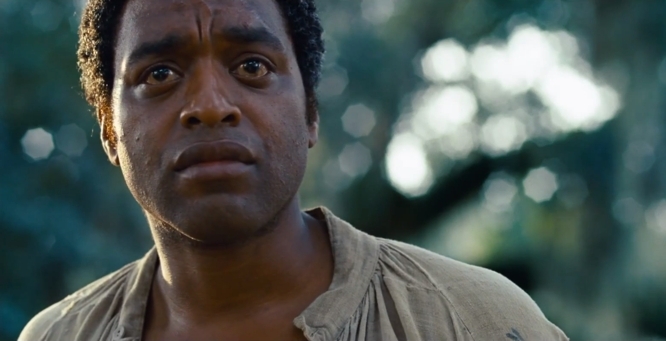 12 Years a Slave is an often depressing film, yes, but it also has one of the most satisfying endings of any film I’ve seen (you’ll cry if you have a heart), and the historical significance of the story and of the depictions of slavery in the film make this film one that I would entirely recommend…if you can stomach it. Chiwetel Ejiofor is a definite contender (and likely the winner) for the Academy Award for Best Actor, and the film itself and Steve McQueen as director just might walk away with Best Picture/Director. When I first saw the trailer for this film over the summer, I thought it was a strange pairing…Ron Howard and race cars? I mean, this is the same guy who directed Apollo 13, A Beautiful Mind, and The Da Vinci Code – none of which are even remotely related to the idea of racing. I was initially skeptical, but I withheld judgement, and I actually started to become excited for the film the closer it got to release. I’m by no means a fan of racing, but the trailers made it look to be more of a drama than anything, which intrigued me. After all, aren’t the best sports films less about sports and more about characters (i.e. Moneyball, The Sandlot, Rocky, etc.)? Thankfully, the trailers didn’t false advertise – Rush is definitely a drama, and an inspiring one at that. 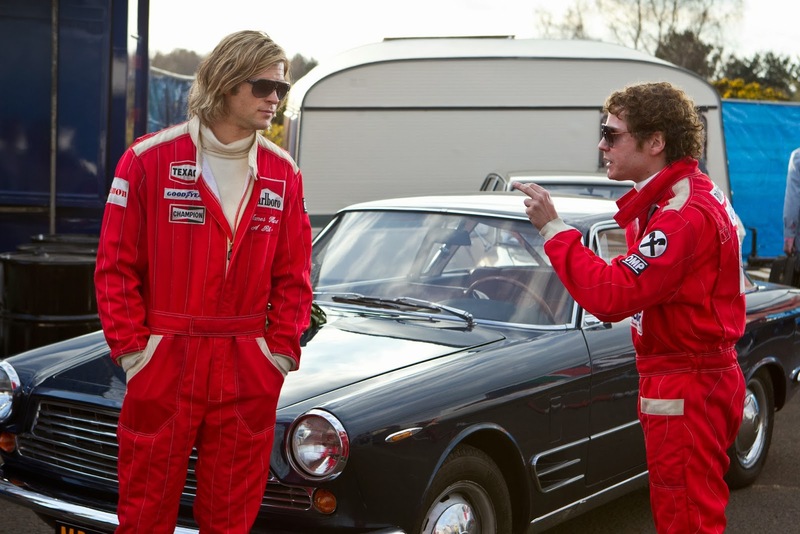 Rush is based on the true story of the rivalry between Formula One drivers Niki Lauda (Daniel Brühl) and James Hunt (Chris Hemsworth) in the 1970s. Both actors give compelling performances, and the contrast between the two of them and what pushes them to do their best is fantastic. Lauda’s “drive,” if you will, is love for his wife and for the sport itself, whereas Hunt’s drive is the thirst for fame and recognition. Lauda has an abrasive personality, and Hunt is well-liked, but despite these character differences it’s hard to not root for both drivers throughout the film; it’s almost as if you would have been disappointed by the outcome no matter who had won. It’s the conviction that Brühl and Hemsworth bring the roles that make both characters so lovable in their own way. I should also mention that at no point in the film did I think to myself, “wow, Thor looks so weird driving a race car!” So that’s a plus for Hemsworth. The emotional stakes of the film are also high; the car crash that nearly takes Lauda’s life is painful to watch, and Lauda’s subsequent difficult recovery is heart-wrenching, especially as we watch him try to put on his racing helmet for the first time after the crash. Olivia Wilde briefly appears in the film as Hunt’s wife Suzy Miller, but she literally has two and a half scenes before her character is finished onscreen, which is a shame because it seems like a waste of talent. Alexandra Maria Lara as Lauda’s wife Marlene Knaus is a new face for me, but not an unwelcome one – her sweet disposition and pretty smile provide a nice contrast to Lauda’s considerably less attractive physique, which makes the pair’s relationship all the more endearing. The racing as seen in the film never bored me or made me uninterested, which is a testament to the actors’ abilities to draw me in and make a subject that I’m not interested in engrossing. The color scheme of both the race cars as they flash by and of the film as a whole is vibrant and exciting, especially when paired with composer Hans Zimmer’s equally exciting score. Zimmer’s music is an incredible asset to the film, combining the action of the racing with the drama of the characters; the main theme is adapted throughout the film to alternately “drive” forward (sorry, couldn’t resist making the joke again…) or to sit back and bring a little more weight to the scene at hand. I think I say it with the release of every new Zimmer score, but he is definitely improving with age. I certainly have my complaints, however. For starters, the film’s biggest issue is that it often seems like it is trying to be overly profound, as if the screenwriter sat in front of his computer thinking to himself, “hmmm, what can I say in this scene that is really deep and intellectual-sounding?” As a result, many lines seem forced, with the best example I can think of being one heard in many of the film’s trailers, said by Hemsworth’s character: “Don’t go to men who are willing to kill themselves driving in circles looking for normality.” Perhaps it’s just the way that Hemsworth says the line, but it just seems completely unnecessary. My other complaint is with the ending, though I’m quickly changing my mind about it. In my initial opinion, it was too anti-climactic, which is a problem often associated with real-life films, especially after such incredible climaxes as the final race. However, what I love about the ending is that it truly highlights the contrast between the two leads. Lauda has matured quite a bit in his journey, but Hunt is still the same person he always has been, a difference that shows the contrast between the drivers’ motivations. So the ending isn’t awful, and the fact that it ends on a quiet note closes out the dramatic nature of the film nicely. Anyway, I really liked this movie. It’s absorbing all the way through, and the performances of the two leads, especially Brühl, are wonderful. It’s not a perfect film, but it is an enjoyable one that is also brilliantly inspiring. Even if you’re not a racing fan, Rush is worth checking out. Randy Newman is back with Pixar for the first time since composing the score for Toy Story 3 back in 2010, which is great since he composed the score for the original film, Monsters, Inc. His score for that film had a jazz-oriented main theme that worked really well for it, and I was hoping for more of the same for Monsters University. While we definitely get “more of the same” here, it’s unfortunately not the “same” that I was hoping for. The first half of this album or so fails to impress me at all. It sounds like nothing more than another Randy Newman score, which, unfortunately, isn’t much of a compliment. Don’t get me wrong – the sound of Randy Newman’s music very much IS Pixar, but a little variation would have been nice, or at least some more extensive reference to the original film’s score. We certainly do get some reference to the original score in the track “Field Trip,” where we hear the theme from “Enter the Heroes” as well as the chase theme from the first film, which can be heard in the Monsters, Inc. track “Mike’s In Trouble.” Anyways, I digress. I actually do have some good things to say about this score. 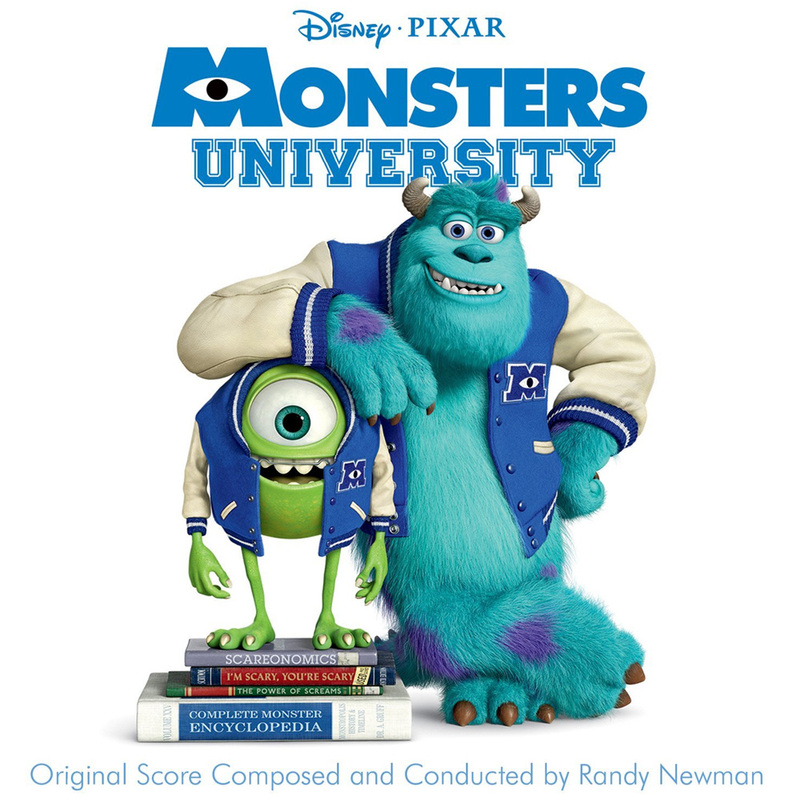 Newman did a good job of composing the Monsters University alma mater, which, in its slower instrumental form (as heard in “Goodbyes”), is slightly reminiscent of this theme from John Williams’ score to Indiana Jones and the Last Crusade – in a good way! Both themes have the same warmth to them. Also, despite my complaints regarding the lack of inclusion of themes from the original score, the quotes that were used were used well, bringing a smile to my face as soon as I heard them. Newman also utilizes what sounds like a marching band (specifically a drum line) to really bring the fact that this takes place at a college into focus, and it works wonderfully. As mentioned before, Newman’s music IS Pixar, or, at least, classic Pixar, so watching the film with his score playing in the background was like stepping back into my childhood. Also of note is the track titled “Roar,” credited to Axwell & Sebastian Ingrosso, which is a fun dance tune. Randy Newman isn’t exactly the most “original” composer out there, as evidenced by the fact that much of this music sounds like his previous work; I can hear bits of Toy Story in “First Day at MU” and bits of A Bug’s Life (my review) in “Rise and Shine,” with several other similar instances popping up here and there. However, all of that is completely, perfectly okay compared to the opening of “Did You Do This?,” when he completely and blatantly rips off his own theme to A Bug’s Life. Make sure you click on both of those links because I want you to be as angry about it as I was when I first heard it…I probably shouldn’t have been driving at the time. Not even Hans Zimmer has been that blatant about borrowing from his previous work! …it frustrates me. Maybe I’m being overly critical for something like this. Like I said, Newman’s score does a great job of bringing familiarity to the world presented in Monsters University, and despite that one HUGE problem and the score’s general tendency to be pretty forgettable, it’s a decent score overall. I have my qualms with it, but it serves its purpose just fine for the average listener and in the context of the film. Total Length: app. 56 min. I don’t have much time to type this out before I go to the theater for the Batman trilogy IMAX screening, so I won’t be going track by track. 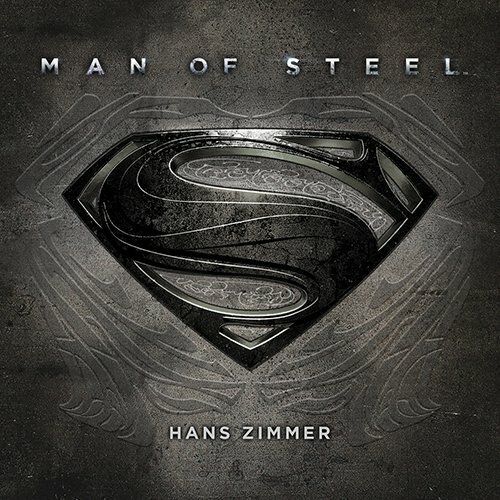 Though some of this music is taken from the previous two films’ scores, Zimmer introduces some pretty cool new themes that add a lot to the character of the album. “Gotham’s Reckoning” starts with a rhythm of two duples and two triples, which repeats through the rest of the track. This rhythm serves as Bane’s theme, and it is the musical version of the chant heard in the various trailers for the film. Sure enough, the chant comes in about halfway through the track, adding a level of anxiousness to it all; presumably, this is being chanted by Bane’s army, which, along with the random bursts of brass and aggressive percussion in the background, makes this track all the more terrifying. Another highlight is the following track, “Mind If I Cut In?”. It opens with some eerie strings which moves into a lengthy piano solo. It brings a bit of a chill down my spine. A later track, “Despair” is really cool because it contains the best instance of the Batman theme (ascending minor third) that I’ve heard out of all three soundtracks; it’s just so pure and heroic-sounding, despite what the title may imply. Speaking of titles implying things, “Necessary Evil” leaves me stumped – who is the title referring to? Is it Bane’s way of justifying his crimes? Or is it Batman realizing that the only way to stop Bane is to break his one rule, i.e. kill him? I sort of doubt that it’s the latter because Batman “truly [is] incorruptible”, but the track provides the emotional sound that could accompany a weighty decision like that. There are lots of great moments to point out and talk about, but I could go on and on and on. 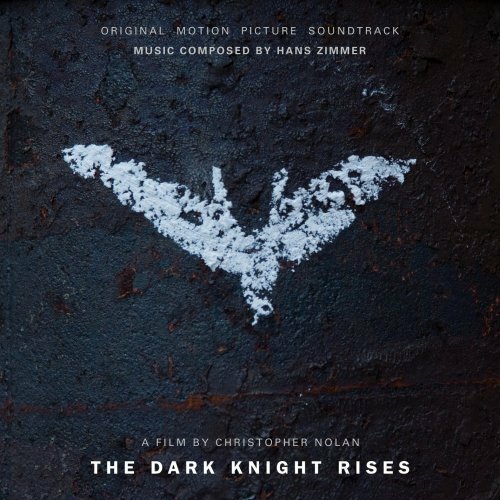 It boils down to this: this is Hans Zimmer’s best Batman score yet. It features a pleasant mix of old and new, with new bits of music that give a glimpse into the kinds of difficult decisions and situations that Batman must endure in the film, and it concludes the trilogy in a truly impressive way. Since Newton Howard didn’t return to collaborate on this score, Zimmer tackled it all on his own. I was worried that it would be too “Zimmer-y” for me, but he did an overall fantastic job. 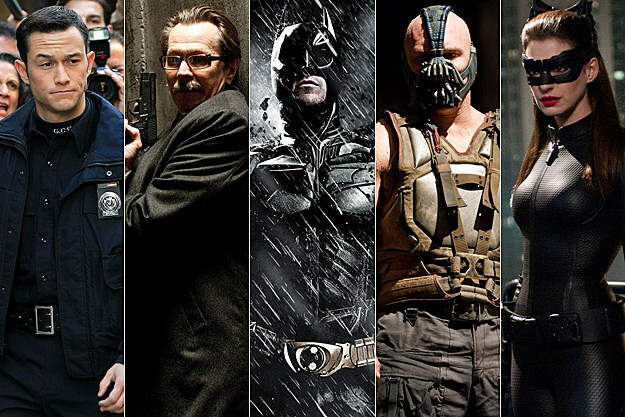 In fact, I’d say that the score for The Dark Knight Rises is better musically than its predecessor. As for how it enhances the movie…well, you’ll have to wait for my movie review tomorrow! Total Length: app. 69 min. P.S. – Read my review of the film here!